You’re not alone. There are 37 million people in the United States who suffer from excessive sweat and/or hyperhidrosis. Fortunately, miraDry offers a permanent solution. Take a quick survey to see if miraDry is right for you. A temporary tattoo is used to mark skin in preparation for the miraDry treatment that's about to begin. 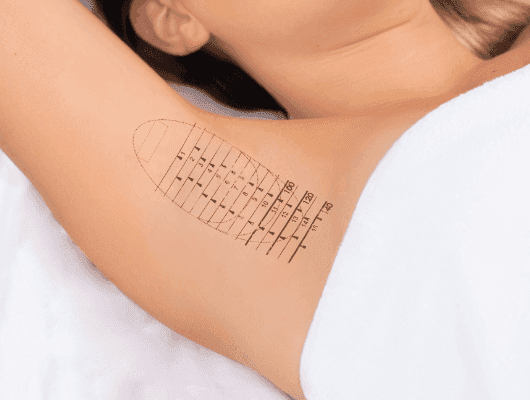 The area is treated with miraDry, eliminating sweat and odor glands in the underarm for a quick and effective treatment. You can expect immediate and lasting results. Once the miraDry treatment eliminates the sweat and odor glands, they’re gone for good. The treatment is clinically proven to have an average of 82% sweat reduction and 89% odor reduction. As with any aesthetic treatment, patient results and experiences may vary. Yes, miraDry has been used in over 140,000 treatments worldwide with an excellent safety record. 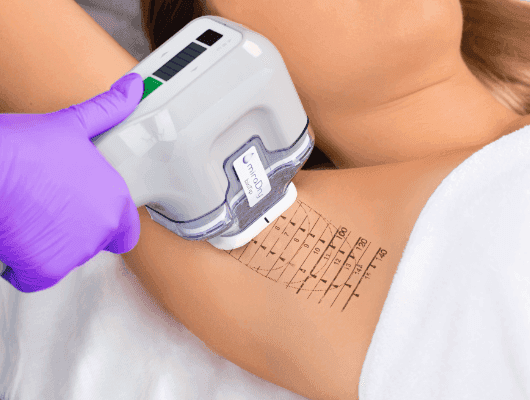 It’s also been cleared by the FDA to dramatically reduce underarm sweat in as little as one appointment. Stressing over sweat? Try miraDry.